Engineered Code - Blog - Dynamics 365 Portal Developers – Don’t Forget About CSS! Dynamics 365 Portal Developers – Don’t Forget About CSS! CSS Classes Here, There, and Everywhere! Thankfully, the way that the Dynamics 365 Portal product has been developed makes using CSS really easy in a lot of cases. The Portal product team has done a great job of including CSS classes pretty much everywhere we’d need them. In this situation, I targeted the parent “notes” and “note” classes just to ensure my rule only applied to this area, in case the “createdby” class was used elsewhere. After dropping that CSS rule in the Custom CSS attribute on the Web Page, the Created By section disappeared as expected. As I said, the Portal product team has done a great job of including classes that make it easy to target elements we might want to change. This is most important for areas where we don’t really have control over the way functionality is rendered, like forums, idea, and blogs. By using the developers tools included in your browser, you can easily discover the class of the element you want to target. CSS rules take effect as soon as they are loaded – you don’t have to wait until the document is ready to apply them. CSS rules are always on, and apply when new elements are added to the page, even after page load. 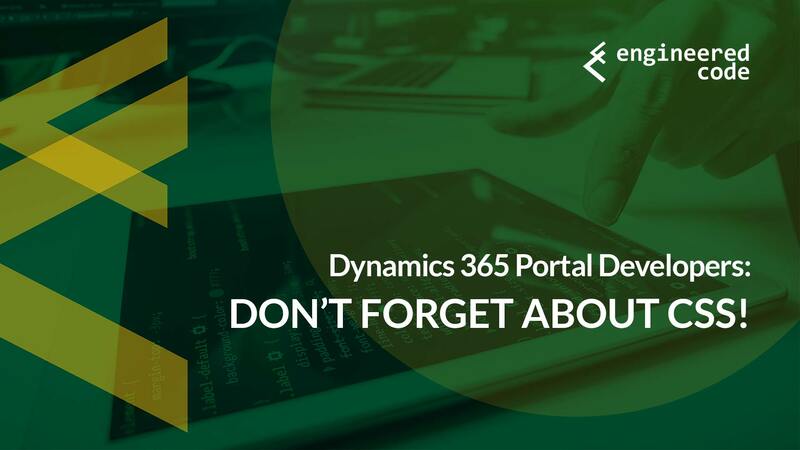 If you’re new to Dynamics 365 Portals and you don’t consider CSS to be a tool in your toolbelt, I strongly recommend that you invest some time in developing that skill – it will most definitely pay off!